Looking for a way to promote your latest designs for ringer tees in a more beautiful and unique way? The menu on the right lets you choose a color for her tee and its rings, then use the upload button on the left to put your design on her tee. Easy, wasn't it? Use Placeit now and make your revenue grow with amazing aesthetics. Try another T-Shirt Mockup! 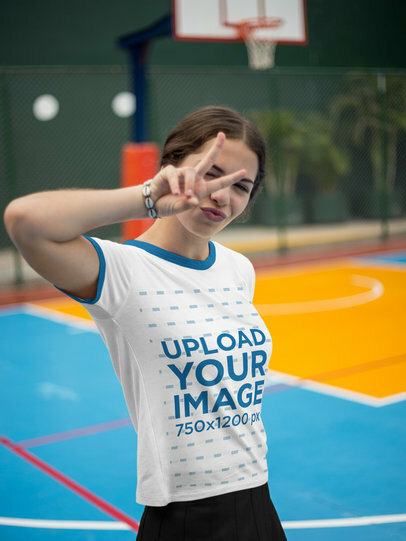 Have a look at this gorgeous visual featuring a cropped face girl wearing a ringer t-shirt while standing against a white wall, you can edit this image to promote your latest designs in an easy and awesome way! The HEX tool on the right side of the page will let you choose a color for the tee, then drag-and-drop your jpeg or png image file over the upload button on the left. Easy, wasn't it? Try another T-Shirt Mockup! Take a look at this amazing image featuring a hispanic woman having fun with a camera while sitting on a vintage styled chair, you can edit this visual to promote your latest designs for ringer t-shirts with a stunning image! The HEX tool on the right side of the page will let you choose a color for the ringer tee, then use the upload button on the left to upload your design. It's as simple as that! Try another T-Shirt Mockup! 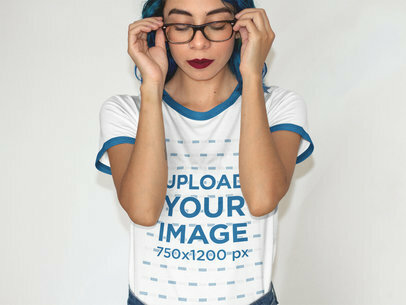 Use this awesome mockup featuring a woman wearing a round neck ringer tee to promote your designs for ringer t-shirts in an awesome and realistic way! The HEX tool on the right lets you choose a color for the tee, then use the upload button on the left and upload your design onto her tee. After a few seconds you will see the processed image on your screen. Try another Ringer Tshirt Mockup! Have a look at this gorgeous visual featuring a hispanic edgy girl wearing a ringer round neck t-shirt while at night, she's near some yellow street lights. Start using this amazing visual to showcase your latest designs for ringer t-shirts in a more beautiful and realistic way! The menu on the right will let you choose the colors for her tee, then drag-and-drop your jpeg or png image file over the upload button on the left. Try another T-Shirt Mockup! Use this stunning visual of a smiling pretty edgy girl wearing a ringer tee while having fun at an industrial area to promote your latest urban designs for ringer t-shirts in an easy and photorealistic way! The HEX tool on the right lets you choose a color for the tee and for the rings, then use the upload button on the left to put your design on the tee. Easy, wasn't it? Try another T-Shirt Mockup! 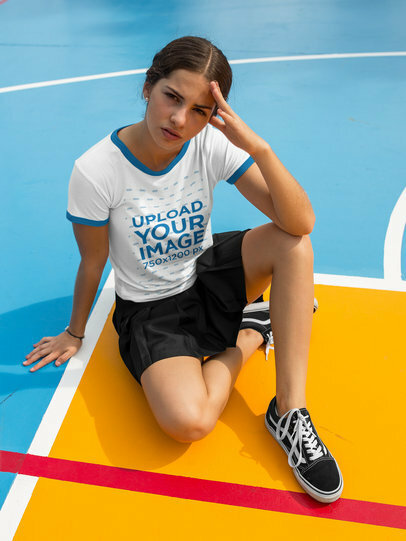 Take a look at this amazing visual featuring a pretty girl wearing a ringer round neck t-shirt while sitting down on a colorful yellow and blue basketball court, it's a great choice to showcase your design with a stunning visual! Start now, the menu on the right will let you choose a color for the tee, then drag-and-drop your jpeg or png image file over the upload button on the left. Easy, wasn't it? Try another Ringer T-Shirt Mockup! Take a look at this gorgeous visual featuring a woman wearing a ringer tee while relaxing indoors. You can now edit this awesome image to promote your latest designs for ringer tshirts in a better way! Use the menu on the right to choose a color for the tee, then upload your design with the upload button to the left. Start using Placeit and make your income grow! Try another TShirt Mockup or check the 2018 t-shirt calendar for inspiration! Take a look at this gorgeous visual featuring a woman resting, she's sitting against a green and yellow wall while wearing a ringer round neck tee, it's an amazing visual that you can start using to showcase your latest design in a photorealistic and beautiful way! Use the menu on the right to choose a color for the tee, then drag-and-drop your jpeg or png image file over the upload button to the left. Easy, wasn't it? Try another T-Shirt Mockup! Take a look at this gorgeous visual featuring a woman sitting against a wall while wearing a ringer round neck tee, you can start using this image to showcase your latest design for ringer round neck tees. It's super easy! All you need to do is use the HEX tool on the right, then drag-and-drop your jpeg or png image file over the upload button on the left. Try another T-Shirt Mockup! Use this gorgeous visual featuring a beautiful girl wearing a ringer tee and a pink sporty skirt to promote your latest designs for ringer tees in a better way! The menu on the right will let you choose a color for her ringer tshirt, then use the upload button to the left and put your design on her tee. Easy, isn't it? Start using Placeit and market your designs with amazing visuals! Try another T-Shirt Mockup! Have a look at this gorgeous visual featuring a smiling girl wearing a pink skirt and a ringer t-shirt while outdoors, she's standing in a field. You can edit this image to showcase your latest designs for round neck ringer tees in a beautiful and realistic way! The menu on the right will let you choose a color for the tee, then use the upload button on the left to put your design on her tshirt. Easy, wasn't it? Try another T-Shirt Mockup! Have a look at this mockup featuring a pretty girl wearing a ringer t-shirt while sitting against a corner inside a white room, you can use this image to promote your designs in a more beautiful way! The HEX tools on the right will let you choose her ringer tee colors, then drag-and-drop your design image file over the upload button on the left. Easy, wasn't it? Try another T-Shirt Mockup! Take a look at this awesome mockup featuring an edgy girl wearing a ringer tee while inside her room, it's a really cool visual that you can use if you are looking to promote your latest designs for ringer tees in a more beautiful and realistic way! The menu on the right lets you choose a color for her tee, then drag-and-drop your jpeg or png image file over the upload button on the left. Try another T-Shirt Mockup! 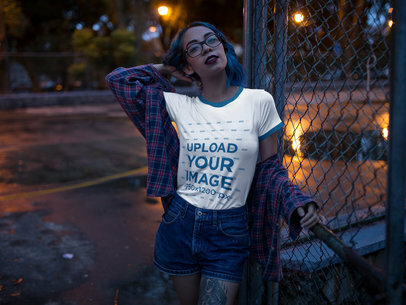 Use this awesome mockup featuring a pretty girl wearing a ringer tshirt and showcase your latest designs for round neck ringer t-shirts in a more unique and realistic way! The HEX tools on the right will let you choose a color for her tee and for its rings, then use the upload button located on the left side of the page and put your own design on her ringer t-shirt. Couldn't be simpler than that! Try another T-Shirt Mockup! Take a look at this gorgeous visual featuring a girl wearing a ringer tshirt at a basketball court while doing a duckface and a peace and love sign. 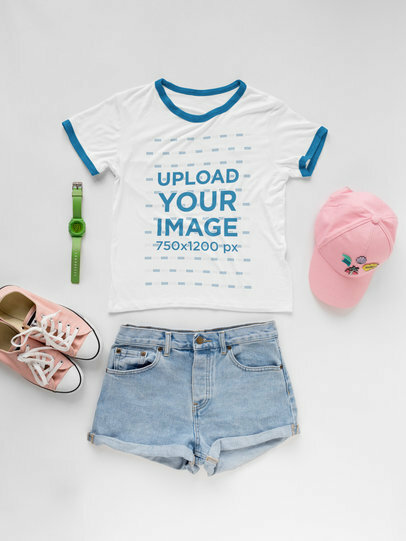 The menu on the right will let you choose a color for the tee and its rings, then use the upload button to the left to put your design on her tshirt. Easy, wasn't it? Use Placeit now and make your revenue grow! Try another T-Shirt Mockup! Promote your designs for ringer t-shirts with gorgeous and astonishing visual assets from Placeit! 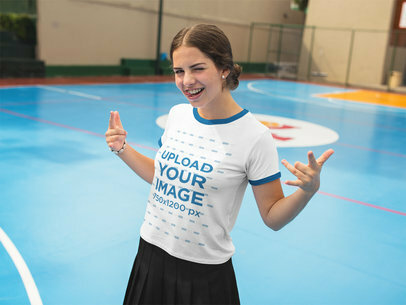 This one features a smiling beautiful girl wearing a ringer round neck tee while posing at a colorful court, she could be showing your design. 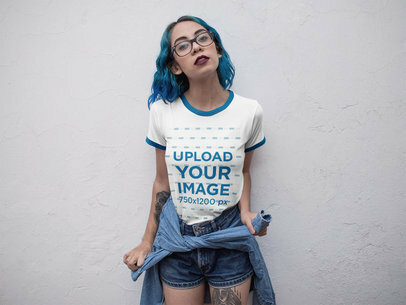 All you have to do is choose her t-shirt colors using the HEX tools to the right, then drag-and-drop your jpeg or png image file over the upload button on the left. Try another T-Shirt Mockup! 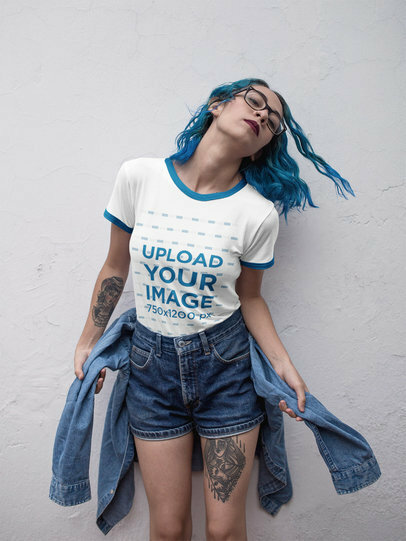 Take a look at this gorgeous visual featuring a beautiful girl wearing a ringer t-shirt while sitting down and posing for the camera, you can now promote your latest designs for round neck ringer t-shirts in a more beautiful and realistic way! The menu on the right lets you choose a color for her tee and its rings, the menu on the left lets you upload a design for her tee. Simple, right? Try another T-Shirt Mockup! Take a look at this gorgeous visual featuring a girl wearing a ringer tshirt while doing a pose, she's sitting on a white bench. Use Placeit now and make your revenue grow with beautiful images! The menu on the right lets you choose a color for her ringer shirt and its rings, then use the upload button to the left and put your design on her ringer tee. Easy, right? Try another Ringer Tshirt Mockup! Take a look at this gorgeous visual featuring a hispanic tattooed girl wearing a crewneck ringer tshirt while sitting on a yellow chair without shoes. You can use this visual asset to showcase your latest designs for round neck ringer t-shirts in a more beautiful and unique way! The menu on the right lets you choose her t-shirt color and rings color, then use the upload button on the left and put your design on her tee. Easy, wasn't it? Try another Ringer T-Shirt Mockup! Use this awesome mockup of a girl wearing a ringer t-shirt while lying on a bed to promote your latest designs for ringer tees in a beautiful and realistic way! The menu on the right side of the page lets you choose a color for the ringer tee, then use the upload button on the left to put your design on her ringer tshirt. Use the cropper and in just seconds you'll see the processed image on your screen, isn't that awesome? Try another T-Shirt Mockup! 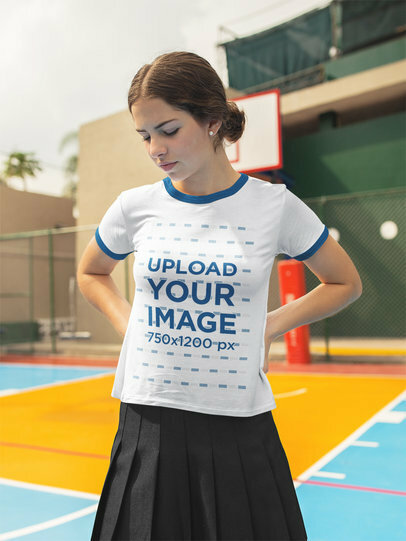 Take a look at this mockup featuring a girl wearing a ringer t-shirt while being silly at a basketball court, you can promote your latest designs in an easy and photorealistic way! The menu on the right side of the page will let you choose a color for the tee and for its rings, then use the upload button on the left to put your design on her ringer tee. Easy, wasn't it? Try another Ringer T-Shirt Mockup! 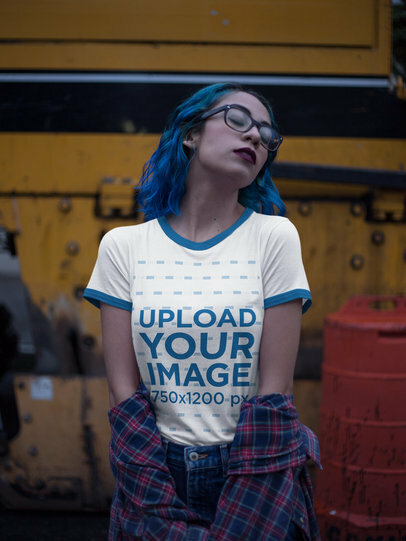 Take a look at this gorgeous visual featuring an edgy girl wearing a ringer t-shirt while lying down on a bed, you can edit this image to promote your designs in an easy and super convenient way! The HEX tool on the right side of the page lets you choose a color for the ringer tee, then use the upload button on the left to upload a design for your ringer t-shirt mockup. Try another T-Shirt Mockup! 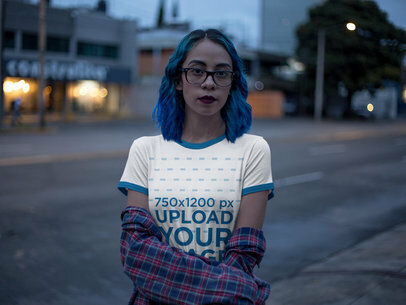 Take a look at this awesome mockup featuring an edgy hispanic girl wearing a ringer t-shirt while on the street, you can use this image to promote your designs in a more realistic way! The menu on the right lets you choose a color for this girl's t-shirt and its rings, then use the upload button on the left. Wasn't that simple? Start using Placeit to promote your latest mockups in a more beautiful way! Try another T-Shirt Mockup! 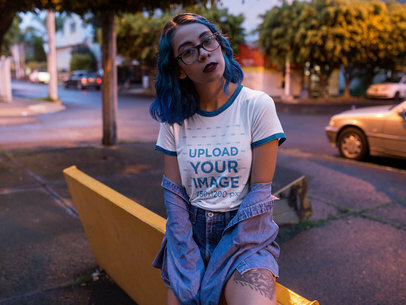 Take a look at this gorgeous visual featuring hispanic girl with blue hair wearing a ringer t-shirt while in an industrial area, you can promote your latest design in a more beautiful and photorealistic way! The menu on the right lets you choose a color for the tee and its rings, then use the upload button on the left to put your design on her tee. Easy, wasn't it? Try another T-Shirt Mockup! Take a look at this beautiful visual featuring a tattooed girl wearing a ringer t-shirt while sitting on a yellow chair, you can edit this image to promote your latest design for round neck ringer tshirts in a beautiful and realistic way! The menu on the right lets you choose a color for the tee and its rings, then drag-and-drop your jpeg or png image file over the upload button on the left. Try another T-Shirt Mockup! Take a look at this gorgeous visual asset featuring a beautiful teenager girl wearing a ringer tee while looking to the floor. You can edit this image to portray your own design for ringer t-shirts in a beautiful and realistic way! The menu on the right will let you choose a color for the tee, then drag-and-drop your image design file over the upload button on the left. Try another T-Shirt Mockup! Take a look at this gorgeous visual featuring a happy edgy girl wearing a ringer tshirt while on a bed, you can use this beautiful image to showcase your latest designs for round neck ringer t-shirts in a really easy way! The menu on the right lets you choose a color for the tee and its rings, the upload button on the left lets you put your own design on this girl's tee. Easy, wasn't it? Try another T-Shirt Mockup! Take a look at this gorgeous visual featuring a woman wearing a ringer tshirt while on her bed, you can edit this image to promote your designs in a beautiful and photorealistic way! The menu on the right side of the page will let you choose a color for her tshirt and its rings. 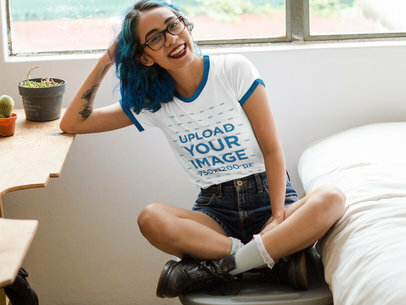 Then use the upload button on the left to put your design on her tee, isn't that simple? Try another T-Shirt Mockup! Take a look at this stunning visual by Placiet, it's an amazing image that you can use to promote your latest design for ringer t-shirts in an easy and photorealistic way! The menu on the right side of the page will let you choose a color for the ringer tee, then drag-and-drop your jpeg or png image file over the upload button on the left. Easy, wasn't it? Try another T-Shirt Mockup!